My boyfriend turned to me in Mid September, and said “Let’s go on vacation in the next two weeks!” Then the next question was: Where could we go on such short notice? Portland, Maine became the easy and obvious choice because it’s close, beautiful, and by the seaside. This trip was focused mostly on hiking and cliff views, but I definitely gave food recommendations to make this city (famous for its lobster), easier to navigate for vegans. This is by far the most recommended spot for me to try in Portland because donuts are perfection. This shop uses fresh potatoes to make their donuts, and it’s popular among non-vegans. They carry a couple vegan donuts at any given time including seasonal flavors. 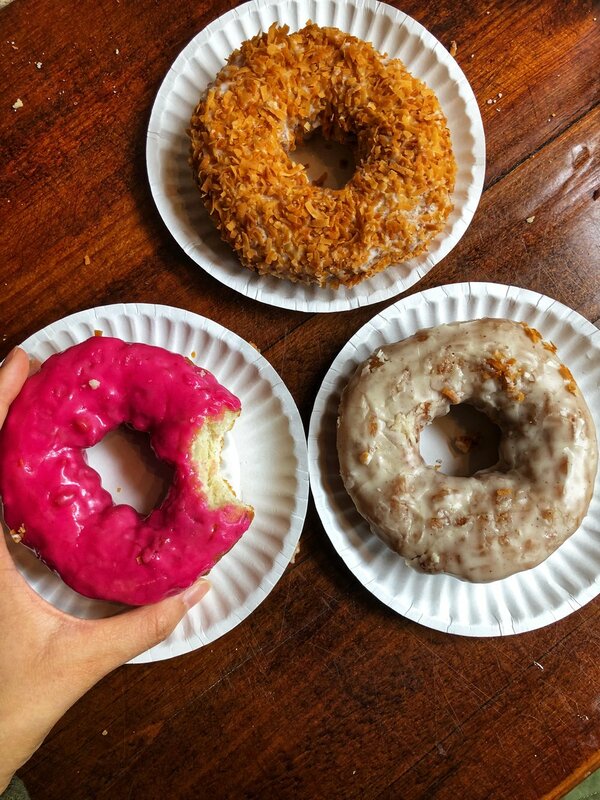 On the day I went, there were six vegan donuts, and I went for the raspberry donut, coconut donut, and chai donut. They were so soft, the right amount of sweet, and a great way to start my trip to Portland. I’m starting this blog post with two dessert spots because of how blown away I was by these sweets. Gorgeous Gelato always has a few vegan flavors in their shop, but on Fridays they have VEGAN FRIDAY, where more than half their options are vegan. Their flavors rotate everyday, but I had an amazing hazelnut chocolate gelato that tasted like Nutella, but vegan. All vegetarian restaurant that specializes in Asian cuisine. I got the scallion pancake, fried noodles, and a coconut milk based Thai soup. Retro vegetarian restaurant with tons of vegan options! It’s super quirky in here, I loved it. This local coffee shop has tons of vegan pastries and cafe items including this vegan breakfast burrito I had that was perfect for my road trip to Acadia National Park. The first dim sum restaurant in Portland includes tons of vegan options. I wouldn’t say this restaurant is super “authentic,” but it’s tasty and a great place to eat if you crave Chinese food. Kombucha bar! You can get a flight and try a bunch of their different booch, all with a low alcoholic level. Old Port is probably equivalent to NYC’s Time Square, but it’s still worth exploring. There are a little of small shops to browse, cute cobblestone streets, and it’s the departure spot for a lot of the boats that take you to Portland’s many islands. We personally didn’t do a boat tour because we only had 1.5 days in the city of Portland, but it’s one of the most popular things to do. The Portland Museum of Art is the largest and oldest public art institution in Maine, featuring rotating exhibits of visual art. One the most popular spots in Portland to take a photo is at the Old Head Lighthouse, which is surrounded by a grassy park, so you watch the waves hit the rocks as you picnic on the grass. Portland is famous for its beer and breweries, but I’m not a huge beer drinker, so I was overwhelmed with the options. Honestly, I looked for the tours that were affordable and popular and the Allagash Brewery was #1 because it’s FREE (can’t get cheaper than that), includes tons of free pours, small group size, and gives you an inside peek at their production process. I got to try 5 different beers on this tour, and it was cool to see how the magic is made. We rented a bike from Cycle Mania and just road around the East Promenade, which features nice seaside views and also along Back Cove, which is a clear lake that reflects the sky. Acadia National Park is about a three hour drive from Portland, but there instead of subjecting ourselves (well, my boyfriend, since I can’t drive) of one straight trip, we made a scenic one day road trip! There’s a lot to see on the drive to the park, and many hikes to do, so give your legs a stretch and take your time to see Maine. We only had a day in Acadia National Park, but you can spend days hiking, running, and seeing nature’s bounty. I wish I had more time, but this was my one day itinerary of Acadia National Park, which captured some of the more popular spots. Note: You have to get your guest parking pass/pay your entrance fee at the Visitor Center. You’re free to drive to a few of the spots without needing to show the National Park pass, but to park you need proof of purchase. One of the notable characteristics of Acadia are the historical carriage roads. This means that a lot of the paths are even, covered in gravel, and great for running and biking. The idea of running in a National Park surrounded by trees and a beautiful lake is a New Yorker’s dream come true. This run had lots of turning points with the opportunity to go even further, but this 6 mile loop was a great way to start the morning! Another beautiful Lake! It was still early autumn when I went to the park, so the leaves didn’t fully change color, but I imagine it’s even more beautiful when the leaves are orange and red. There’s a higher-end restaurant housed within the National Park, appropriately named the James Pond Restaurant, which is a nice treat compared to the peanut butter sandwiches I always pack myself on these day trips. I had a hummus and veggie wrap, which had seasonal veggies. This is one of the shorter hikes in the park (about an hour round trip) that gives you a view of the park from a high point and features a huge rock that’s perfectly positioned at the edge of a cliff. You can drive up to this highest point in the National Park (or you can hike it if you have time) and catch a 360 degree view of Acadia National Park. When we went, it wasn’t a clear day, so we were covered in a Stephen King type ominous fog, but the drive up still had tons of amazing views. PS: The gift store up on the peak of Cadillac Mountain contains a delicious grape soda. I highly recommend it. Park Loop Road is a 27 mile driving road that takes you around all of Acadia National Park. There’s tons to see on the road, but since we didn’t have tons of time, I checked out Sand Beach (the only sandy beach on the island) and Thunder Hole, which is an inlet of rocks by the ocean where waves crash with a thunderous Thor swinging his hammer kind of boom. Bar Harbor is the main town in the area with cute restaurants and bars. Portland: Staying in Old Port will be the easiest to get around (parking will be tight), but I also stayed one night in East Promenade to see more of the coast. Acadia National Park: Bar Harbor are where the hotels are as well as many AirBnB’s. We stayed with a couple minutes away from the park, and they were super nice with a homey space.